Which Burns More Calories: Mopping or Slipper Genie? I saw these slippers on Amazon.com called Slipper Genie. You’re supposed to use them to mop the floor. They are said to make mopping easy. They actually look kind of cool. The question that I have is: if they are supposed to make mopping easier, does that mean that I’ll burn less calories by using them instead of a mop? Wouldn’t it be better for me to bend over the mop using my legs, back and arms to wash the floor than to just skate around the floor with some funny looking slippers? Do I really want to make my housework easier when it is one of the few things left in my routine that burns calories (besides official exercise, of course)? What do you think? Is Slipper Genie better for me or should I stick with a traditional mop? One note about the study is that while the low-fat and Mediterranean diet followers had a restricted caloric intake of 1500 to 1800 calories a day, the low-carbohydrate group were not restricted in their calories. I find it difficult to maintain a low-carb diet, but I know I feel better when I follow one. Here is a little incentive for me to monitor my sugar and carbohydrate intake. This photo from The Library of Congress attracted me. Here are a group of girls from Chicago, competing in Sokol Sports in Austria. The idea of physical education as well as the promotion of moral values was formulated by Miroslav Tyrs, a professor of the Charles University, and by Jindrich Fugner. The philosophy, evolved from the ancient Greek ideals of “kalokagathia” and now propagated by Miroslav Tyrs and his followers, became the basis of the movement, which is connected with the origin and destiny of the Czech (Czechoslovak) Republic. Four times Sokol was banned or its activities were restricted by wars or totalitarian regimes. It was still alive, though- in other countries, in communities of Czech immigrants on all continents of the world. 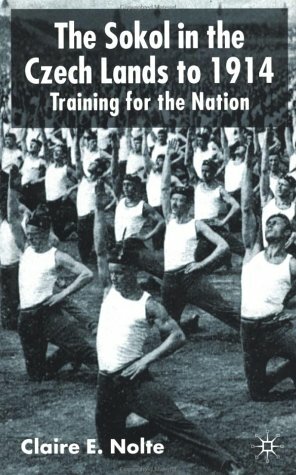 The history of the Sokol, the Czech nationalist gymnastic organization, from its founding in 1862 until the outbreak of World War I emphasizes its role in articulating national values and facilitating mass mobilization in the political context of the multinational Habsburg state. By including background on the German Turnverein, this study goes beyond the Czech context to explore the intersection of gymnastics and mass nationalism in Central Europe. All of this makes me wonder why those girls from Chicago were there in Prague, so long ago. Does anyone have any knowledge of this? On another note, the idea of staying physically active and strong as a service to our nation has been talked about a lot in our news. It’s not addressed on a nationalism level, but the idea that America has become weak because of our obesity epidemic is an underlying theme. Is it our patriotic duty to stay fit? Keeping motivated is a constant struggle for me. Saturday night I sat in my comfy chair desperately trying to think what I could do to motivate myself to eat healthy and exercise. I felt so out of control that I couldn’t think of anything that would convince me to take care of my body. Toys? I have all the cool toys I could ever want. Movies? My Tivo and NetFlix bring movies that I will love to my doorstep whenever I want them. Books? I have a stack of books that I want to read and haven’t given myself the time. Time? I have the same problem with taking time for myself as I do for eating healthy. Money? I have all the money I need in that little debit card in my purse. Then I remembered something from my teen years that hit me. When I worked at K-Mart, putting myself through college, they paid me every week in CASH. I don’t know if they still do that, but back in the 80’s, that was their policy. I would take half of that cash and hoard it away for tuition and books. I LOVED the growing stack of bills hiding in my desk. Sure, I have a bank account that accrues interest (however minuscule), but that is for serious things like paying the IRS and saving for a home. The idea of that envelope of hoarded money was appealing to me, so I set up a bribery scheme based on that idea. Weekly Goals Journal Sheet from Starling Fitness: Excel spreadsheet for use with MS Office or Open Office. 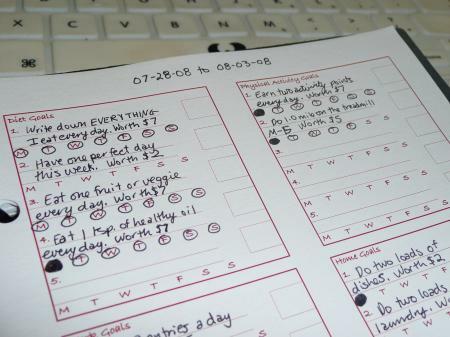 I can set goals for my diet, physical activity, work, home, family and joy. I have set dollar amounts that I can collect and hoard in my little envelope every week. Of course, you can give yourself stickers, bribe yourself with time, movies, books, whatever works for you. It took me a long time to find something that was inspiring for me. Sit down and find out what will work for you and then set some goals for yourself. The water felt good. I felt alive. I was bobbing up and down while marla crammed my skis on my feet. I began to think that this might actually be a success. I imagined myself gliding across the lake, one handed, smiling and waving as I flew by all my friends, their jaws dropped in awe of my swan-like figure and grace. I would hop back onto the dock, kick off my skis and wrestle with some small child, not even acknowledging the applause. I would be so modest. Why was I never able to stand up? Was I destined to always be dragged like a limp doll in the bathtub? My face was red in an unhealthy looking way and my chest felt like a large man was sitting on it. My confidence, like a an old sweater, was unravelling all over this lake , but there must have been one thread of it left in tact, because I held up my pointer finger and gurgled the words “one…more….time”. It took about week to feel normal again. The pain left me, the bruises, the broken blood vessels in my eyes faded. But what has not faded is the fact that I tried to do something that I feared. And while I did not succeed fully, I succeeded partially. And thats good enough for me. 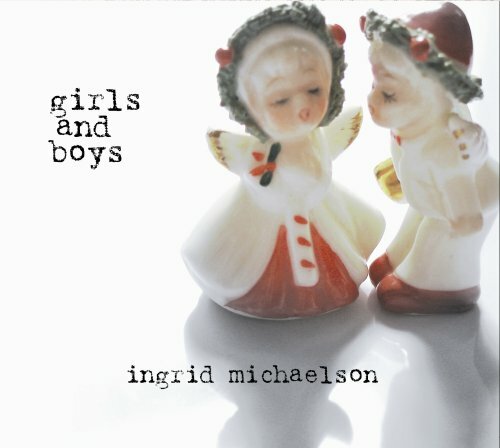 Next time you’re confronted with a physical activity that looks impossible to you, remember Ingrid Michaelson trying over and over to water ski and continually ending up with water filling every orifice of her body in failure. If she can keep going, then so can you. On September 1, 1915, a 14 year old girl swam across the Hudson river, turned around and swam back. Her name was Mary Elizabeth Miller. This photos is part of the George Grantham Bain Collection at The Library of Congress and it is supposed that it might have been mislabeled. It could be that this photo is a documentation of the famous swim across the Hudson. I used to love swimming when I was a little girl. Now, as an adult, I get no pleasure from spending hours in the pool like I used to. What was so fun when I was younger just seems boring now and I wish I could get that childhood enjoyment out of it again. Part of the problem is that I’m so blind without my glasses or contacts that I can barely see well enough to not bump into things, so swimming is a lot less fun. Part of me just thinks that’s an excuse, though. Sometimes the joys of our youth do not translate to joys in adulthood and it’s hard to release them. We just need to find other methods of activity that appeal to us as adults. Where Is Your Obese Husband? Of course, it didn’t ask me where my “obese husband” was, it asked where Elvis was. Mike and I set up our Elvis Mii on Wii Fit so people could play the game without playing as one of us. 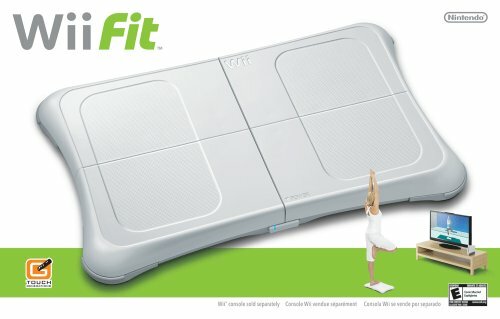 As cool as the Wii Fit is, it’s not really set up for party games. It’s more of an exercise game, so when our friends want to see what it’s like, it bugs me if they play using my Mii. Of course, it has been weeks and weeks since Elvis has played, so the Wii Fit balance board asked me where he has been. I didn’t have the heart to tell my imaginary trainer that Elvis is dead. Here is an excerpt from FAT: What No One Is Telling You that was shown on PBS. The story that this woman tells is a familiar one. Everyone who gets their life in control can tell of the day when they realized that others considered them fat. What’d ya think her her frickin’ problem is? I don’t know. Maybe she’s cryin’ ’cause she’s frickin’ fat and no one wants her. This isn’t simple. This is not a simple balance between energy in and energy out. If it were, we would have solved the problem a long time ago. We have a very rich and accurate physiological system that keeps our energy in balance. And all that system has to do is get disrupted by a tiny percent. Just a one percent mismatch in that system can lead to a 130 to 140 pound weight gain over your adult life. Only 5% of the people who get gastric bypass surgery get to a normal weight. Honestly, medical science doesn’t know what makes us fat. The most important thing is to take a new look at fat people. Fat prejudice is the most important issue right now and blaming the victim has stopped us from finding the solutions more often than it has helped. Raymond Raving Rabbids Lets You Exergame In Style! I LOVED the Rabbids in their last two Wii games and I can’t wait for this new one! You can also follow a chocolate lab and I was passed by a white dog, so I’m going to try to follow him next. It’s fun to discover these hidden routes in this game. I had no idea that running in place could be so fun! Apparently there is also a black dog that you can follow. You should mute this video so you don’t have to listen to the racist kids.